This week has been quite a challenge - that's why I am excited to see Monday come again... It's a new week! Time for a fresh start! Also time for another challenge at Craft Your Passion. 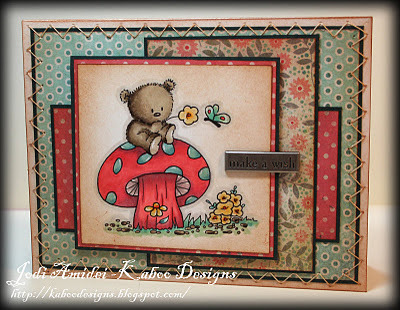 This week we got a chance to work with some adorable images from our sponsor Crafty Sentiments - just too cute. Our theme is Beary Wishes - your project must have bears on it. I picked this cutie-patootie image with this sweet fuzzy bear sitting on a giant mushroom. I colored him with my Copics, and distressed the edges with sepia ink. Isn't he precious? I added a bunch of layers of My Minds Eye design papers, a hand-stitched zigzag border and a simple metal sentiment. It's truly a simple design, but it looks like I spent hours. I love that in a card! Go dust off your bear stamps or hunt through your digi's and find that bear image - then create away and join us at Craft Your Passion Challenges. You'll be entered for a chance to win some great prizes, including images from Crafty Sentiments and a $10 voucher for Robins Nest. Thanks for stopping by. Here's hoping this week is better than the last!!! I hope your week is much, much better. Your card is adorable. Wonderful coloring, great layers, lovely sewing, and the metal sentiment is the perfect contrast! Saw your beautiful card at MIM! What an adorable image and colored so beautifully! Very pretty papers! Love the layout and fabulous sewing on your card! so cute and adorable card. I saw your card at MIM challenge. How adorable Jodi, gorgeous colouring, love the layers and papers, great stitching. Thank for sharing at Make it Monday.. This is gorgeous. The papers all work well and the stitching is perfectly done. Excellent job. Thanks for joining Speedy Fox and Friends. I love all the layers on this. Such a beautiful card. This is so gorgeous. I love everything about it, your colouring - the papers - your stitching - your layout at of course the image. Thank you for joining us at Karen's Doodles this time and good luck. This is so sweet Jodi and I love the stitching! Thanks for joining us for the My Favourite Things Challenge at Pollycraft! Sweet card. Great DP, very complimentary. Thanks for playing along with us here at Speedy Fox and Friends challenge, we hope to see you again next week. Make sure to check out our challenge with Friends of SpeedyTV for more fun with Mark's Finest Papers, a Heinrich Co.